Glaswegian-born Bob Spiers remains one of the most experienced television comedy directors, with a career spanning over thirty years and several channels. He entered television production at the BBC in the early 1970s as an assistant floor manager on such series as Doctor Who (1963-89) and Cilla (1968-76). He also worked in this capacity on an episode of the WWII home guard comedy Dad's Army (1968-77), and in 1973 the series' co-writer, producer and director David Croft promoted him to the position of production assistant. It was thanks to this association that Spiers won the opportunity to direct many of Croft 's collaborative comedies from 1976, including episodes of It Ain't Half Hot Mum (1974-81), Are You Being Served? (1973-85), Come Back Mrs. Noah (1978) and the final series of Dad's Army . In 1979, he reluctantly took on the challenge of directing the second series of the award-winning Fawlty Towers (BBC, 1975; 1979). However, his skill in realising John Cleese and Connie Booth 's tightly written scripts was widely praised. In the early 1980s, after directing the unbroadcast pilot episode of Not the Nine O'Clock News (BBC, 1979-82), he went freelance, and produced/directed the final series of The Goodies (ITV, 1982) for LWT , as well as directing 15 original episodes of Are You Being Served? for Australia's Channel 10 . It was in 1982, with the launch of Channel 4 , that Spiers began to shape the television development of the alternative comedy scene. The channel's opening night featured his comedy The Comic Strip Presents... Five Go Mad In Dorset (tx. 2/11/1982) which established the creative talents of performers like Adrian Edmondson , Peter Richardson , Rik Mayall , Jennifer Saunders and Dawn French , and introduced a fresh, biting style of comedy to television, shot not on video but on film. It was, ironically, Spiers ' experience on more traditional comedies that enabled him to find a visual style to suit the new generation. 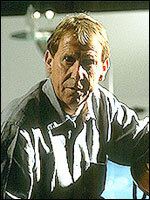 After directing eight Comic Strip films, he tried his hand at drama, directing many episodes of the comedy-tinged children's series Press Gang (1989-93), about a junior newspaper. At the same time he directed 15 episodes of French and Saunders at the BBC , including the one-off sketch that inspired Absolutely Fabulous (BBC, 1992-95; 2001-). Spiers directed over 25 episodes of the award-winning high camp series. Other credits in this period included the anarchic Bottom (BBC, 1991-95) and Dawn French 's chilling comedy Murder Most Horrid (BBC, 1991; 1994-96). His situation comedy work has also been complemented by many sketch-based shows for Stephen Fry and Hugh Laurie , Ruby Wax and Alexei Sayle . After working in television for nearly 25 years, Spiers turned his attention to film, and in 1997 he directed Disney 's That Darn Cat (US). At the height of the popularity of the all-girl band The Spice Girls , he was invited to direct their first and only venture into film, despite insisting that he had never heard of them before. Spiceworld: The Movie was first screened at Christmas 1997, and although a financial success, this Beatles -esque film met a muted response, despite its fun-filled approach and star-studded cast. In recent years, Spiers has continued to direct television comedies in Britain and Australia. In 1999 he directed the short-lived 1970s parody Days Like These (ITV). He received mixed praise for his direction of A Tribute to the Likely Lads (ITV, 2001), which saw Geordie duo Ant and Dec recreating the roles of Bob and Terry for a one-off special. The same year saw the feature film Kevin of the North , and he is currently engaged in a US film project with John Cleese entitled Bob the Butler .